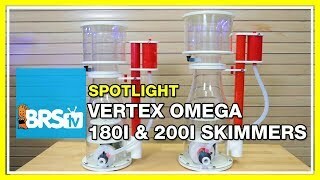 The Vertex Omega skimmer is one of the nicest skimmers you can find in or out of its price range for tanks up to 180 gallons. We use the Omega line of skimmers on a few different tanks around BRS and find them to work really well, and at the same time looking nicer than almost all others on the market. 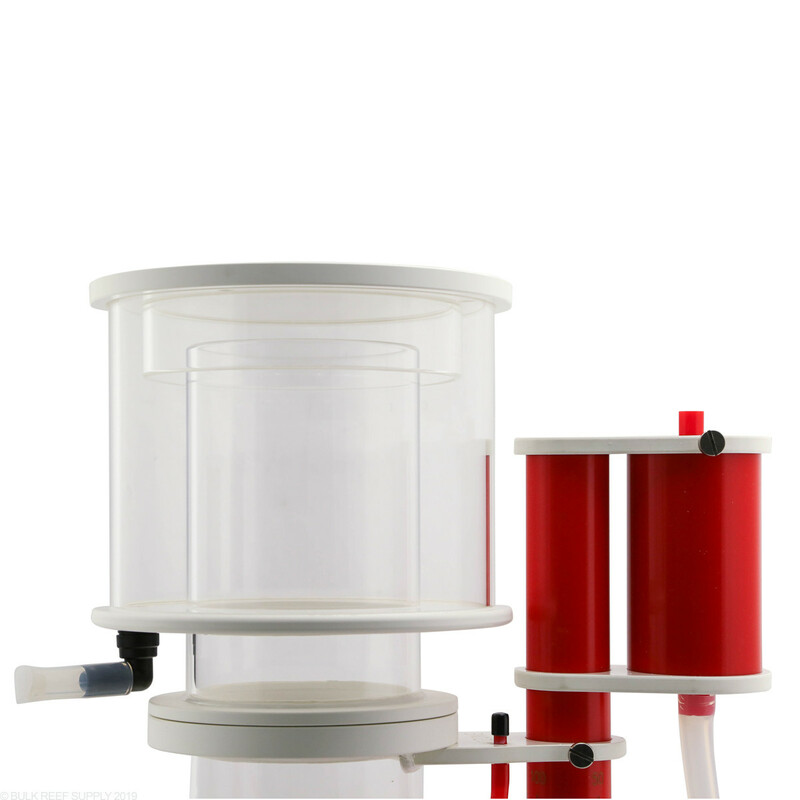 Note: The red ozone tubing is no longer included with the current series of Omega skimmers. Been running this skimmer for almost three years. Not a single problem with it. Running just as good as the day I got it. I now have it connected to an avast skimate collector. Only thing I would change with the skimmer cup would to make it so it pops off instead of screwing it off. Shut the skimmer off to do a water change, wouldn't restart. Took the pump apart and found a cracked impeller. Great quality skimmer body. Sicce pump is garbage. Vertex emailed me back within 30 minutes and has a new impeller on the way under warranty. Kinda feel misled after dropping $400 on this product. I’ve been running the 180i for over 4 months and yet has not successfully tuned it. I shutdown it to do my annual tank maintenance and when turn the skimmer back on it wouldn’t start. I found out that impeller crack and still looking for a replacement. I honestly feel ripped off and have to but another skimmer knowing I can’t find replacement part which is silly. The only good thing was the quality of the acrylic was excellent. I installed the skimmer two weeks ago. The material quality of this skimmer is excellent, but the pump is by no means silent. My prior skimmer was a Skimz with a DC motor and it was definitely quieter. That said, I've only had this skimmer runner for a couple of weeks so I’m hopeful it will quiet down over time. My biggest complaint, right now, are the Omega’s instructions related to the break-in period. It took 5-7 days for the skimmer to work properly, not 24 hours as they state. This was super frustrating! The skimmer wouldn’t stop overflowing until I finally raised it several inches higher than was recommended. After about a week, it finally started breaking in and I was able to lower it to the recommended water level. The Omega 180i creates a very impressive thick lather which I assume will do a great job once the skimmer is fully broken in. 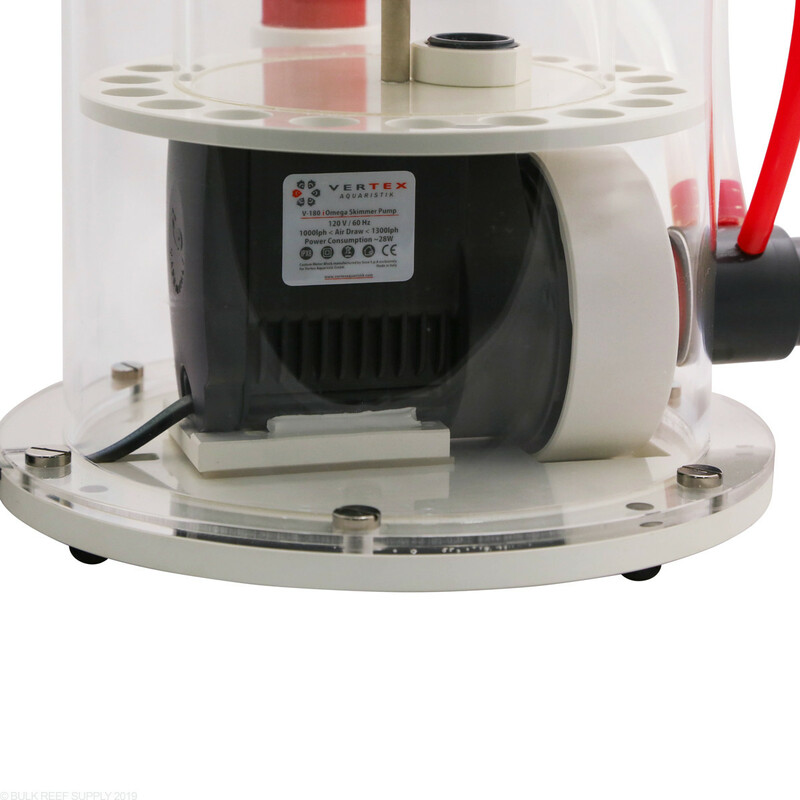 From reading other’s review, I am definitely concerned about the pump, but time will tell. Two years in I have had 3 impellers. The needlewheel breaks free from the shaft everytime. Beyond this Vertex support doesn't warranty "moving parts due to wear and tear". Won't be buying any more vertex products. Build quality LOOKS good, skimmer works well, but warranty and actual durability is marginal at best. This was my first high end slimmer. I'm glad I went with this model. It's not only beautiful and very well made. 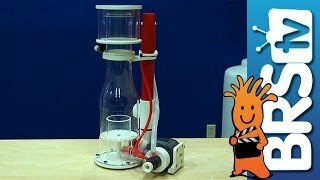 It's works flawlessly and produces lots of skimmate. I have two of them. One in my 90 gallon and my 55 gallon. 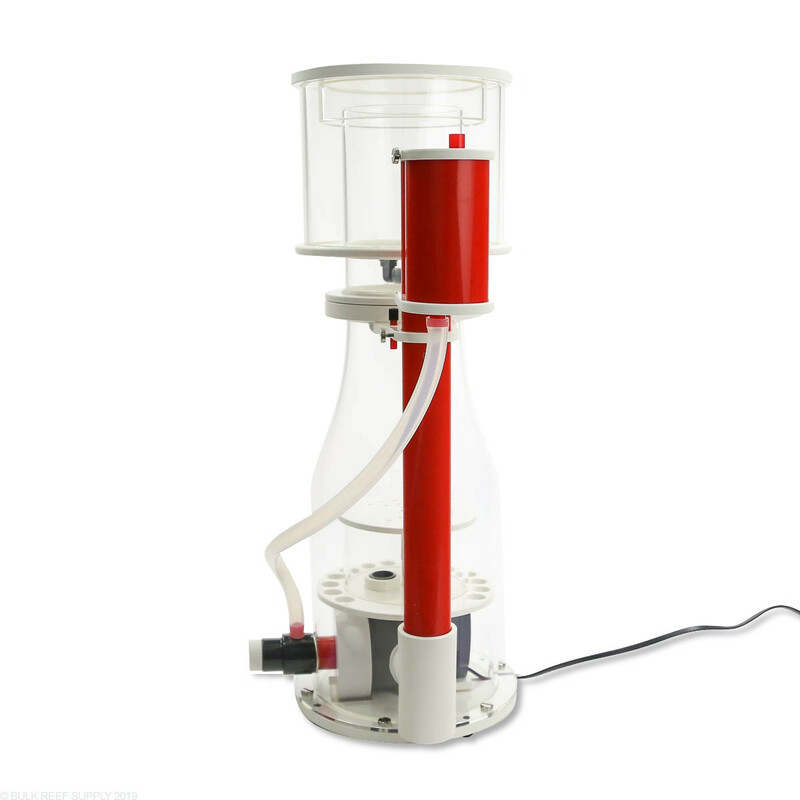 The Vertex 180i is a great quality skimmer for a good value. When you open up your skimmer, it feels like it has been crafted well with thick, quality acrylic. I have never had a space saving skimmer and have been impressed. 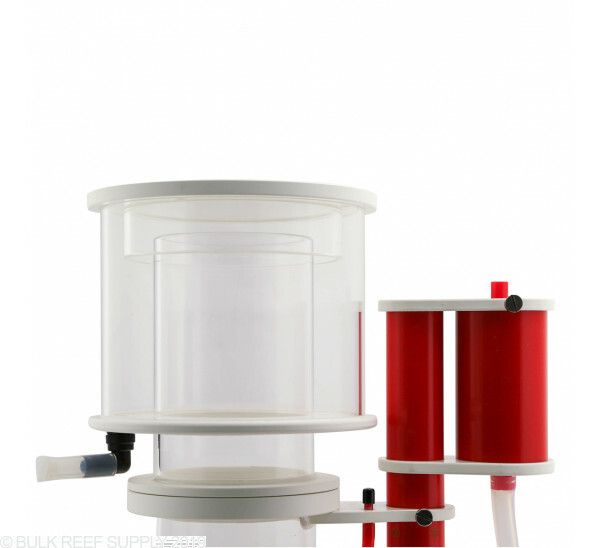 The collection cup twists off smoothly, so if the collection cup is completely full, the waste water won’t spill back into the sump. The collection up is a little too narrow because I can’t reach the bottom to clean it. I also think that the drainage hole was poorly designed and felt like an afterthought. The pump is much quieter than my previous 2 reef octopus skimmers and also has hardly vibration. It creates a decently fine micro bubble. The water level within the skimmer is adjusted easily but sometimes the pump silencer gets in the way. Overall the craftsmanship of the vertex is great and I am very happy with it. I've had this skimmer a couple of months now and it is awesome. I have it dialed in to pull thicker darker scum. Its quiet and effective. I recommend this skimmer hands down. I've used reef octopus in the past so having the threaded cup in contrast was much appreciated. So I am updating my review from about 2 years ago. Bought this for my first ever large scale tank (120g) I have not had a single problem with it. It puts out nasty skim that is very dark. I don't have any other skimmer to compare it to but I think this was one of the best investments I could have done for my tank. It continues to work great and is very quiet. Only thing I did not like about the skimmer was the small red PVC nub that is supposed to hold the C02 hose in place near the adjustment valve. It snapped off while I was trying to connect the tubing to it. No biggie I still like the skimmer and would recommend it to anyone. Just be careful of the nub. Get someone with dainty hands to attach it and you'll be good. Only improvements I would like to see is an adapter so I can connect some extension tubing to drain the skim away into a separate container. I have managed to get something on but it is next to impossible to get off when you want to clean the cup I don't like worrying about a dangling hose full of slime on my carpets. Just installed this skimmer and it live up to its name..
My skimmer has been noisy from day 1 and continues to get worse. Have tried to get a replacement impeller as this seems to be a known issue but these are impossible to find! Vertex have no support line and do not respond to email. This is not an issue with BRS but if you get an issue it seems binning it and buying another brand is the only option! The optimal height will change depending on the load of your tank as well as many other factors. Typically around 7 inches or the lower end will make it harder for the skim to reach the top causing darker thicker skim. Feel free to let us know if you have any further questions! Would this skimmer be overkill for a heavily fed 90 gallon? This will work great with a heavily fed 90 gallon tank! 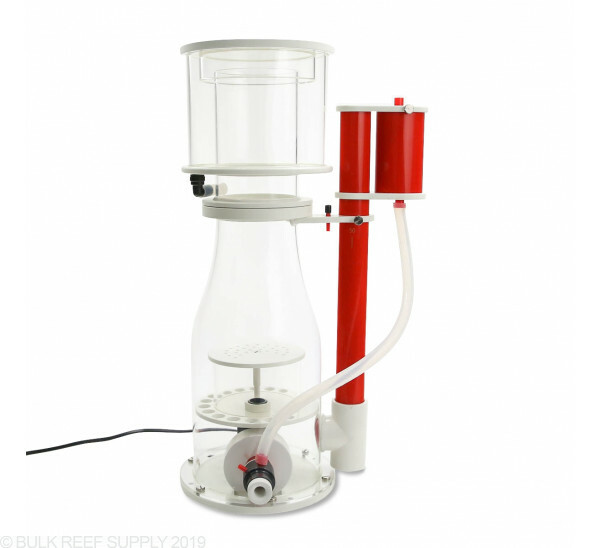 Can this be used external, specifically can this be modded to be used in conjunction with a canister filter? This skimmer is unable to be run externally and will need to be placed in a sump. Feel free to let us know if you have any further questions! What is the diameter of the collection cup? It would be 180mm :) With most skimmers the model number actually correlates to the diameter. Hi, I am pre planning my reefer 525xl and wonder in a heavy bioload tank if this will be enough? Do you use the total system volume or just the display tank volume? In most cases you will base the volume off of the tank. 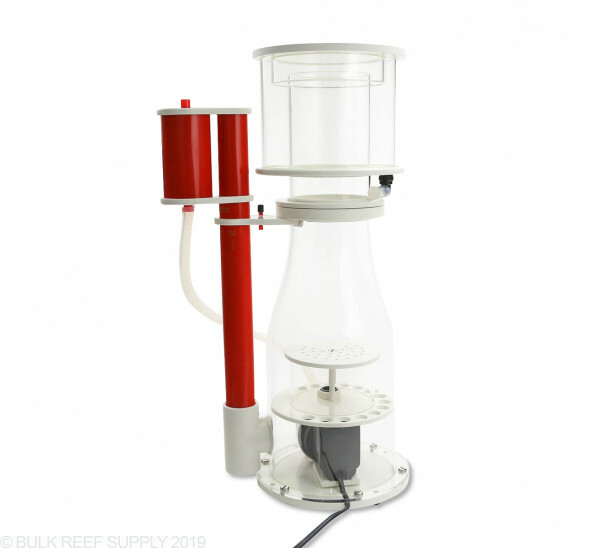 If the sump is large enough with a large refugium you can take that into consideration however for the reefer you can simply base the skimmer off of the tank volume The 180i would be a great fit for medium bio-load. Feel free to let us know if you have any further questions! This will have a 6' power cord. Feel free to let us know if you have any further questions! On the ozone, is there a hourly limit like on other skimmers? (ex. 50mg/h) also, how do you run carbon on the exit since its underwater? I run a external recirculation Mazzi style skimmer so not schooled up on the new gen stuff. Thanks! There is not an hourly limit for the skimmer. In most cases if you are planning on running ozone you can add a bag of carbon to the output and in the collection cup. This is often why we recommend an ozone reactor instead of running ozone and your main skimmer at the same time. 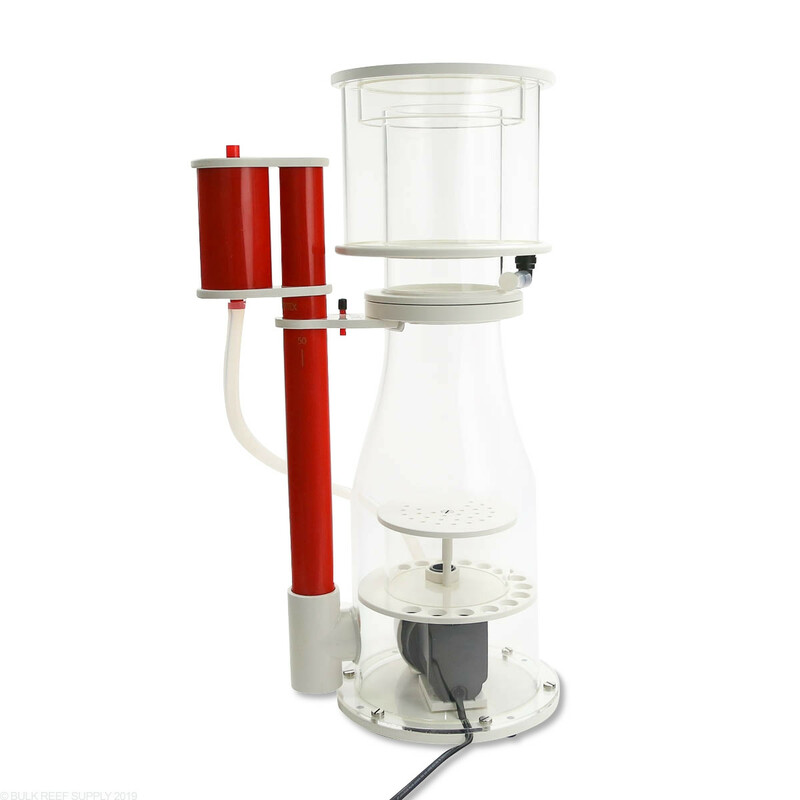 I recently purchased this skimmer from you and I am wondering if it will fit in the skimmer section of the Emerald Sump 26 - Trigger Systems - The specs call our the footprint of this skimmer as 10" x 11" and the skimmer area of the Emerald 26 sump is 9" x 10" - I'm wondering if it will actually fit given the configuration of this skimmer and the true area of the sump. Thanks! Thanks for getting in touch with us in regards to fitting this skimmer into the Emerald 26 sump. This would NOT fit into the Emerald 26. It would be just a little bit too large. 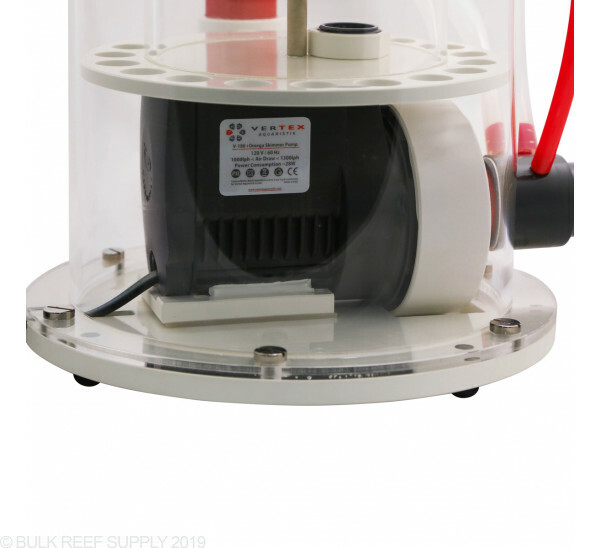 I can say however if you are looking to fit a larger skimmer onto this sump, I would recommend looking into a space saving skimmer that houses the pump in the base of the skimmer. Please let me know if there is anything else that we can assist with. Thanks! 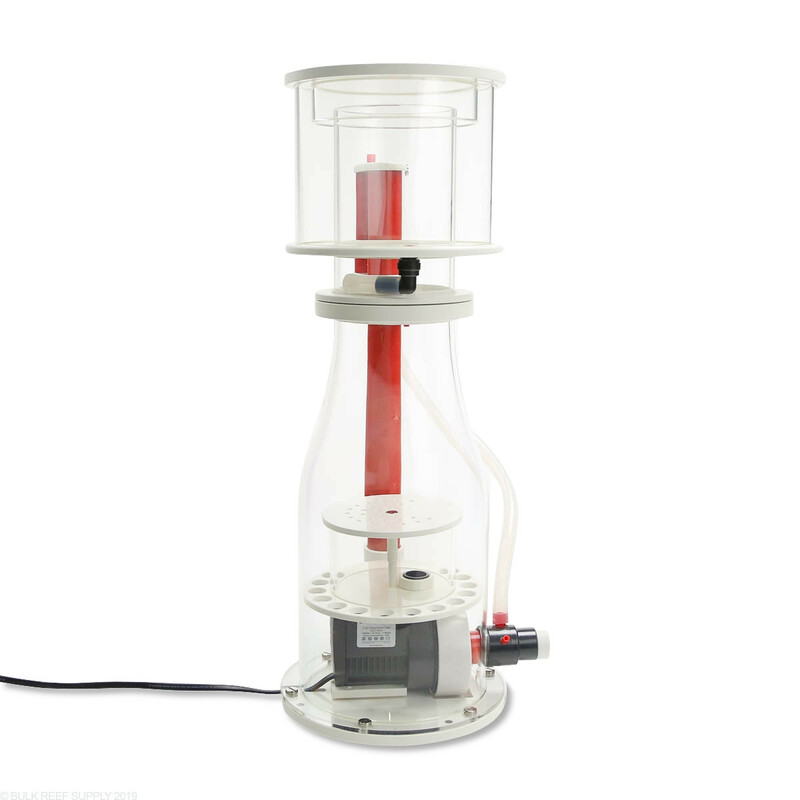 Will this skimmer fit in a trigger 36 sump ruby? This skimmer will fit in the Ruby 36 sump that Trigger makes. Have a great day! The Omega 180i would be a great choice for a tank setup like that.